The Pillars of Spectacle is an intensive physical theater seminar that integrates the training forms of acrobatic stiltwalking, butoh dance, contact improvisation and synthesizes them in the compositional scaffold of physical theater. The seminar is best taught in a residency fashion with a committed core of participants who can share their learning process together. The skills accrued during the residency would strengthen the capacity of an ensemble to create dynamic spectacle-based work together and increase the acrobatic stiltwalking skills of the participants. The residency would lead towards the creation of material that could be presented in an informal fashion to the general public. Acrobatic Stiltwalking skills (Stiltasanas) include: lifts, falls, partner exercises, still point encounters, stick work, groundwork and geometrics plus core strength and balance building exercises from ashtanga yoga and pilates. Acrobatic Stiltwalking has been at the core of The Carpetbag Brigade’s evolution and international success. The ensemble has created diverse techniques and exercises to prepare the body for the intense physical impact of stilts and simultaneously developed a way of integrating a sense of theatrical aesthetics into the teaching of their work. Contact Improvisation exercises focus on: developmental movement patterns in the body, the giving and taking of weight, movement as metaphor for relation, and safely releasing the body into precarious balances with others. Contact Improvisation is the foundational movement practice for The Carpetbag Brigade. It emphasizes release in the body and relation between individuals through the basic and core concept of weight in space. Specifically adapting the principles of contact improvisation to acrobatic stiltwalking has created a sense of grace in partner exercises and sharpened the awareness of lifting and falling on stilts. Butoh dance work leads the participants into: altered states of physical expression, activating imagination in the body, ancient memory as departure, timeshifting, animal nature, transcending habit, psychophysical endurance, awakening hidden energies, seducing ghosts and harnessing liberation. Butoh dance is an antidote to overreliance of spectacle technique. The Carpetbag Brigade uses Butoh to engage a dialog with archetype, shadow, history and character. Enmeshing a butoh sensibility with stiltwork brings in a multi dimensionality to the theatrical possibilities of stilts as well as confronting performers with the evolution of their essence as human beings. Physical Theater exercises access: departure points of improvisation, initiating frames of composition, evolving and refining forms and scores, arranging narrative structure and dynamic sequencing. Composition and narrative are used as devices for framing dramatic narrative and character. Constructing tight vital expressive forms that layer and augment meaning and emotion enable the company’s performances to transcend cultural boundaries. The Pillars of Spectacle can be constructed as an ongoing course with each element present every day or as a series of pods. 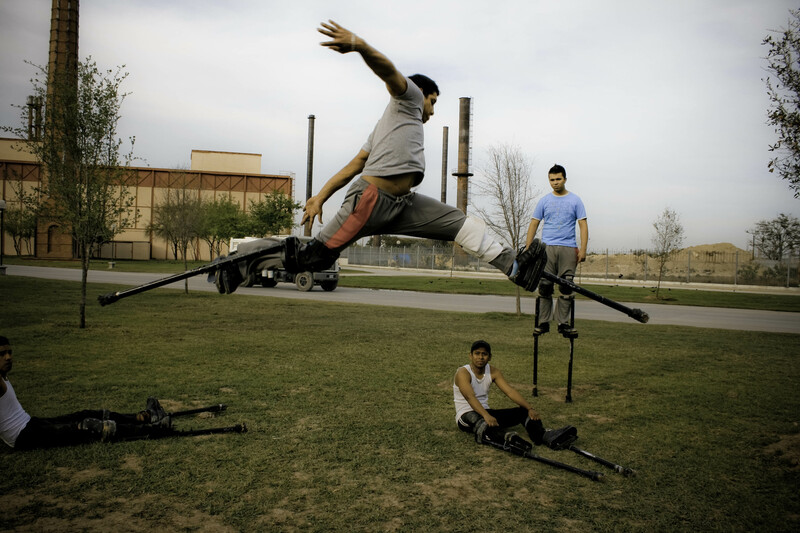 The acrobatic stiltwork (stiltasanas) is an optional part of the seminar. It can be eliminated as part of the seminar or activated as the primary focus. The intent of this seminar is to provide training tools and creative processes for performers and preferably ensembles to transform their expressive bodies, safely take physical and aesthetic risks, and evolve a collective ethos and aesthetic around working together. The seminar requires a serious time commitment and primary focus on the part of the performers for the duration of the seminar. A minimum of 10 full days is necessary and a full month is desirable. Seminars utilizing the stiltasana portion require all participants to be outfitted with aluminum stilts. *Aluminium stilts can be purchased at Daddy Long Leg Stilts Company.